Dwarf basil in the first ZipGrow experimental greenhouse. Dwarf basil has smaller leaves and is bushier than most varieties. Basil is a well-loved crop in almost every community. Basil belongs to the mint family (Lamiaceae), along with rosemary, oregano, thyme, and several other popular herbs. Our favorite basil varieties are the classic sweet basil (Ocimum basilicum), Genovese basil, Thai basil, and dwarf basil. Sweet basil is a favorite among the Upstart Farmers. Herbs are much more profitable than leafy greens, and can be a fantastic crop line for market growers. The pricing you receive will vary depending on your market. For example, Direct to Consumer markets like a CSA can often see prices as high as $2 or $3 an ounce, while wholesale markets like restaurants may land in the $1 to $1.50 an ounce range. A recent price check at Target revealed that a 3/4 ounce clamshell package was retailing for $2.00, which comes out to $2.66 an ounce at the point of sale. A general rule of thumb is that wholesale pricing will be 40% to 50% of retail price. If mint scores a 1 in difficulty (it’s quite easy to grow), then woody herbs like basil are at the other end of the scale. Although basil isn’t needy in terms of water and pH, it does require pruning (see below) to achieve full yields and grows best in high temperatures which can be tough to match with other crops. When you can achieve ideal conditions, you’ll be amazed at the growth you can get from your basil crops. Matt Marsh is a basil farmer in North Carolina. Over the last year, Matt has focused on growing high-quality basil for his community above other crops and has several tips for new basil growers. 1. Control humidity: The shape of basil leaves tend to catch water and hold it, so controlling condensation is very important. High humidity (above 70% for extended periods) has been problematic for us. We try to keep our humidity between 40–60% in the greenhouse. I haven’t seen any issues with running a lower humidity throughout the day but the basil transpires heavily in the dark periods. We haven’t seen low humidity for longer than 12–14 hours at a time. *Good air flow but not a lot of “wind” on the plants. Basil is very sensitive. 2. Light: Have a supplemental lighting option! We are currently fighting to fill orders because this winter has been much lower in light. Our basil grows decently with 10–12 hours of light but that is on the low end of weight per tower at a 5-week cycle. Supplementing light is almost a guarantee. We didn’t supplement light for the first year and got away with it because our demand wasn’t consistent. Now that everyone looks to us for basil, we have had to do “harvesting gymnastics” to keep everyone happy. 3. Diligently manicure: We have always had random dying leaves (damaged, blocked from light, etc.) on the plants. We have learned to go through and pull as many off as we see because they have always affected the leaves around them in some negative manner. Some stick to the other leaves and damage them, others become a sponge and drip onto the other leaves, and others grow fungus. In short, clean around the plants well. 4. Prune: We have used harvest time as a way to prune plants that are end- or top-heavy. If the growth on the end of the stem is too heavy, it will split from the main root base and become bitter. If the stem/root is damaged we harvest immediately or throw it out. * Do not pinch. Invest in sharp sheers! You will damage or pull off a whole stem more often than you think! Basil has been bred to be a single-stemmed plant growing upward. For most growers, a bushier plant is better. A pruned plant looks better, yields more, and can be easier to transport depending on your growing method. Upward growth is called apical growth. To change the way that basil grows, growers can trigger a secondary type of growth that moves outward and up instead of straight up. This is called lateral growth. A young basil plant (say 5–10 inches tall), has buds on the side of the stem that haven’t grown out yet. Those are the lateral buds; they’re the back-ups that will only grow if the main stalk gets badly damaged or removed. This means that if growers clip the stem right above those lateral buds (a half inch or so), the buds will be triggered to grow out. By pruning basil this way, growers can increase the production of that branch and control the shape of the plant. If you prune a basil plant correctly, then you’ll see an increase in yield each time you harvest for the first three harvests (around weeks 5, 8, and 11). Every time something like this happens, we ask, “did he put it in a cooler?” and always, the answer is yes. Usually, coolers are kept at 40–45º degrees, but basil doesn’t have the cellular machinery to deal with those temperatures. A few warm-weather crops respond to cold temperatures with rapid decay. To extend the shelf life of basil, store it above 55º F (preferably at a temperature of 60º). At this temperature, it can attain a shelf life of 12 days. Instead of cooling the basil, keep it in a higher-temperature cooler, or on a counter in a cool room. For home consumers, a jar of water on a counter works great. “We use vented bags and keep the basil out of sunlight at all costs! Our restaurants keep the bags in dry storage of some sort and most just hang the bags in the kitchen away from heat and certainly not in the cooler! If the restaurant has a wine cooler it is usually kept around 60–65ºF and can be a great place to store it. What if customers don’t listen to you and still store it in a cooler? Matt has solved this problem by providing a test bunch free of charge so that customers can see the results themselves. Handle basil gently, as bruising can increase the rate of deterioration. Many Upstart Farmers have found that selling basil packaged in clamshells is helpful for preserving the herb. Get ready. Get set. Grow. Upstart Farmers can grow incredible basil to serve to their communities, and it’s definitely a worthwhile herb! Leave comments if you have questions, and don’t forget to check out our other crop posts. Great article. Where have you found luck sourcing the vented bags? Evan, glad this was helpful – thanks for reading! Matt uses a local supplier for his harvesting supplies because he can try out new products quickly and saves himself time in researching each product. (He recommends this to new growers as well.) He actually just switched to a draw-string plastic bag because he can fit it into a 5-gallon bucket, harvest directly into the bag, and save labor time. Hi Amy, is Matt still using the drawstring plastic bags? These could be very handy on our farm. Hey Ryan, I believe so. 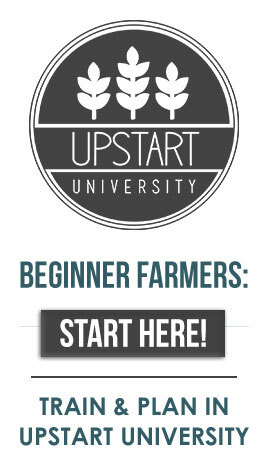 If you’re looking for suppliers, I’d throw the question out in the Upstart U Community on Facebook. Other farmers might have recommendations. The PDF document on sale on your website has other values for PH and EC. Are the ones on the blog the best one or the one in the PDF? Hi Maxime, thanks for the heads up on that inconsistency! These are a bit more conservative so stick with the ones here. I have a question on how to read the reference cards…harvesting for basil is done 8-10 weeks from transplant or from seed? Not sure how the timeline should be read. Hi Andy, it’s the age of the plant – so you can do the first harvest when it’s 8-10 weeks old. This usually ends up being about 6 weeks after transplant, depending on the conditions. Forgive my confusion, I am very new to this. We are in the works of developing our business plan and want to try and define a more accurate cost analysis/production estimates. We are working with some small restaurants and not sure of the scale to start at. In the Zipgrow production estimate pdf, the chart shows that at week 5 (on a 5-week turn) there is an estimated 3-4 lb harvest per tower. My question is, would you be constantly harvesting throughout the harvest life (5 weeks) of the plant or would you only have three total cuts? Thank you for your time in advance. You guys really are doing a great job providing very useful information. Hey Raymond. The numbers in the estimates are for once only at the listed intervals, rather than a little bit each week. Hi what do you recommend for your hydroponic system? Is it simple enough to build yourself or is there a prebuilt system you recommend? Hi Ken, the type of system you use depends on your space, climate, and growing goals. There are several turnkey systems that work for basil as well as DIY-type systems. A Bato bucket system will be more hands-on, while a Farm Wall is more of a ready to go kit. If you’re tossing around pros and cons of different growing techniques, I recommend the “Choosing Your Production Technique” course. The 5.6–6.6 is just a more conservative range. We recommend that one. Is this correct? On day one the seed goes into the plug. 7-10 days later the seed germinates. 3-5 weeks in the seedling is transplanted into the tower. 8-10 weeks in is the first harvest. Then every 3-5 weeks is another harvest from the plant. If this is the case, how long on average does that plant stay in the tower? Thanks!! The variation in the timeline for this is due to the fact that there are many different varieties of basil, each with their own grow timelines. Some will be much faster (F1 hybrids), heirlooms are typically slower. The short answer is that most varieties will see a max of 3 harvest cycles (and some choose to only do a single cut harvest). We have not been growing basil due to the fear of being stuck with excessive amounts at harvest. We concentrate on distributor/wholesale market and large volume/demand crops. Is it difficult to get high-production basil to a distributor chain or do they tend to buy low volume as well? I find it much too expensive for larger operations to grow small volume niche products. It is more practical I think to get agreements for large orders that can be planned on a routine basis via a distributor. Try an herb formula like this one from Chem-Gro. Would you be willing to share where Matt got those squarish white pipes? Im in Philippines and I dont seem to see them in the hardware stores near me. Are these some sort of specialized pipes? Secondly, that simple pruning tip (second “Y” area) gives me a relief. I’ve been too scared to prune my basils as I thought it would hurt them. Those are ZipGrow Towers! I’m glad you like them—you may purchase them at zipgrow.com. I hope your basil is doing well. Ohhh, “zipgrow”. Ok Mia, I’ll search for this one. I hope this could help me scale-up my basil garden.